Today marks Navasard, an ancient Armenian new year festival. For many centuries Armenians had been celebrating the New Year, Navasard, on August 11. Celebrated by people of all walks of life, it is the first day of the new year according to the ancient Armenian calendar and a festival commemorating Hayk’s victory over the Babylonian tyrant Bel, thus establishing the Armenian nation. Navasard was dedicated to 7 Armenian pagan gods: Aramazd (the Supreme Armenian God, the Father of all Gods and Goddess), Anahit (the Supreme Goddess), Astghik (the Goddess of Love, Beauty and Water), Nane (the Goddess of War), Vahagn (the God of Thunder and Lightning), Mihr (the God of Sun and Heaven Light) and Tir (the God of Wisdom, Science and Studies). According to the mythology, on this day the Gods came down to the Earth to bathe in the sacred River of Aratsani and then watched people celebrating the holiday. I THOUGHT THAT WAS HAYK KILLING BEL -SO OUR NEW YEAR’S DAY IS INDEPENDENCE DAY ALSO? THANKS FOR THE INFORMATION ON OUR MYTHOLOGY. I WONDER HOW WELL IT STOOD UP AFTER NOAH’S FAMILY LEFT THE ARC? GOD HAD BEEN SPEAKING TO NOAH, NOT SOME ONE OF MANY GODS IN A PANTHEON. I DON’T SUPPOSE THEY GAVE MUCH CREDENCE TO OLD SUPERSTITIONS FROM THAT POINT ON. 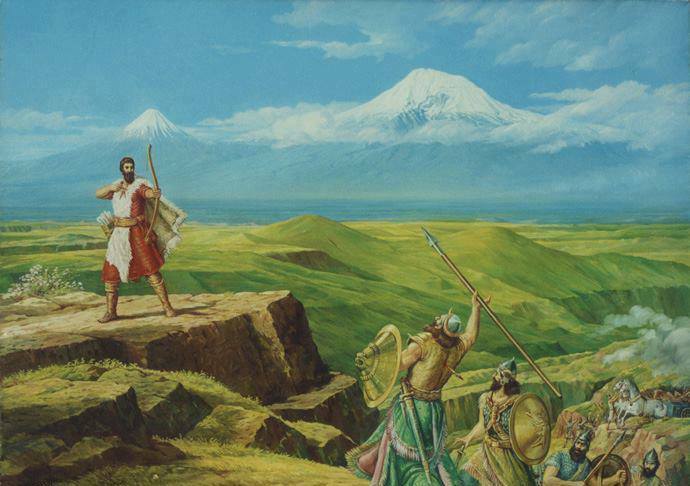 ONE GOD IS NOAH’S CONTRIBUTION -THE ARARAT-MINIAN CONTRIBUTION. GOD REVEALED HIMSELF TO NOAH FIRST WITH THE RAINBOW COVENANT.